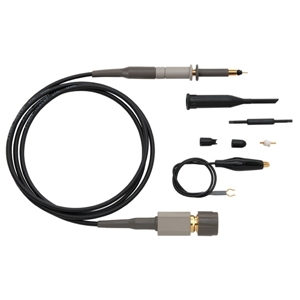 The ProbeMaster "GOLD PROBE" has been designed specifically for use with Tektronix, Hewlett Packard and other high performance oscilloscopes. This new slim design along with a host of versatile accessories, allows you to reach the most difficult test point in today's highly complex circuitry. The gold plated Probe Tips, Sprung Hook, Ground Lead, Alligator Tip and other critical interconnect points within the Gold Probe, provide excellent contacts for probing low level analog signals and high speed digital data. If you are unsure what you need, call us and we will match a probe to your exact model.